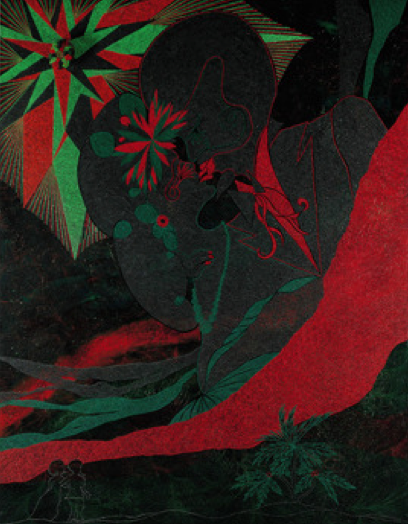 Afro Apparition, Chris Ofili (b.1968) all pictures from Sotheby’s unless otherwise noted. Today Sotheby’s London held their October Contemporary Art Auction to coincide with Frieze Art Fair which is currently underway in London’s Regent’s Park and art observed was on site with coverage. The 223 lot auction comprised of work, in a range of media, by leading post-war artists such as Jean-Michel Basquiat, Chris Ofili, Gerhard Richter, Anish Kapoor, Damien Hirst, Frank Auerbach, Anthony Gormley, Farhad Moshiri and Yan Pei Ming. 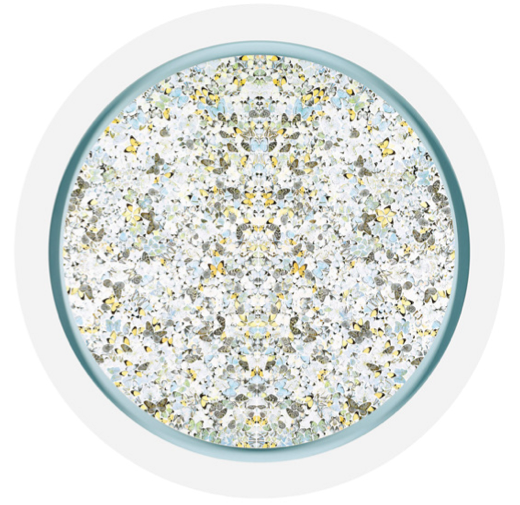 73% of the contemporary works were sold and the eventual total of the sales came in at 12,757,125 GBP. All sale totals stated in this article include buyer’s premiums and come directly from Sotheby’s official website or courtesy of The Baer Faxt. 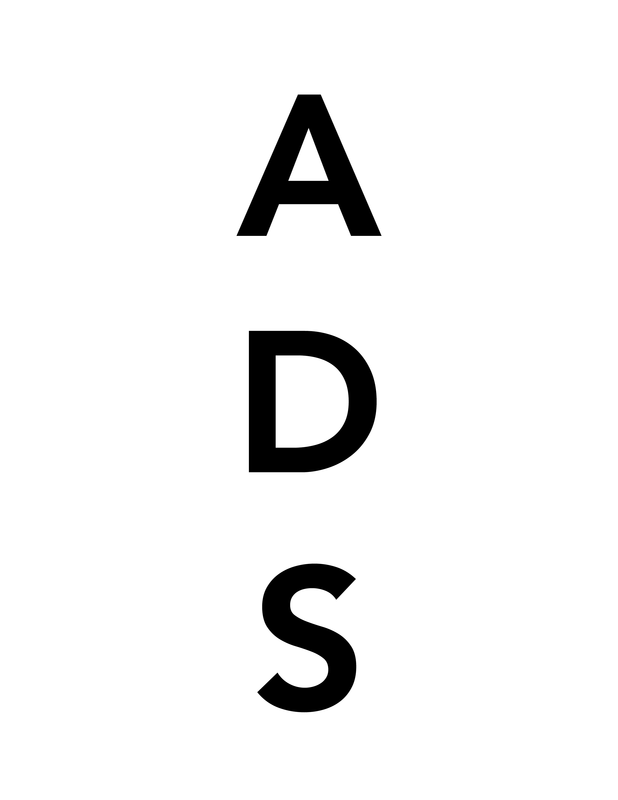 More text and images after the jump…. 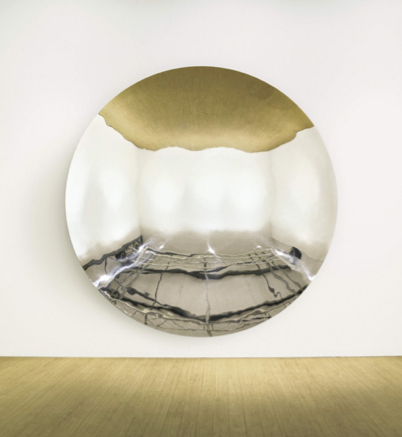 Coinciding with his retrospective at London’s Royal Academy, Anish Kapoor’s Untitled, was noted as a highlight by Sotheby’s before the auction had taken off. Executed in 1997, a time marking Kapoor’s breakthrough with this type of reflective material, in material and spatial possibilities that characterize the very best output of this world-renowned sculptor. It was estimated to sell between 600,000 – 800,000 GBP and eventually went for above estimates at 825,250 GBP. Tracey Emin was present in the front row of the Sotheby’s sale this afternoon and aided in the auctioning of her own work, Those Who Suffer Love. 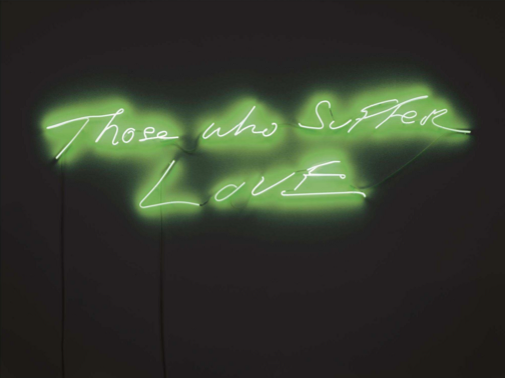 The neon work was the title piece of Emin’s solo show at White Cube Masons’ Yard earlier this year and it sold at, 49,250 GBP – much over its intial estimate of 20,000 – 30,000 GBP. 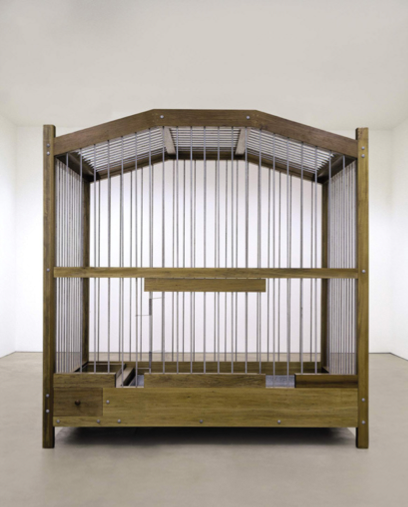 This work was part of a series of nine exhibits auctioned today that were donated by artists such as Jake and Dinos Chapman, Tracey Emin, Rachel Howard, Anselm Kiefer, Sarah Lucas, Grayson Perry, Boo Ritson, Conrad Shawcross and Bernar Venet for which the proceeds are to be donated to Harefield Hospital. Another work causing a great stir prior to the auction was Jean-Michel Basquiat’s, Fuego Flores; a painting executed when Basquiat was only 23 years-old – the very height of his brief and brilliant artistic existence. Text, word-play and his unique poetry were paramount constituents to his street art, and his innovative and brilliant use of language adorns his most highly regarded paintings such as this painting in which his words, “FLOWER – FLOWERS, FLORES” and “FIRE – FIRE(S), FUEGO” cover the top, left-hand corner of the image. Such is the importance of this image in Basquiat’s oevure, it is reflected in the final sale price of the piece – 959,650 GBP. While Mugrabi may be “The Man With 800 Warhols,” today he missed the chance to own Warhol’s portrait of Joseph Beuys which was bought by White Cube for 301,250 GBP. Joseph Beuys and Andy Warhol met for the first time at Hans Mayer’s gallery in Düsseldorf in 1979, a year before this painting was completed in 1980. 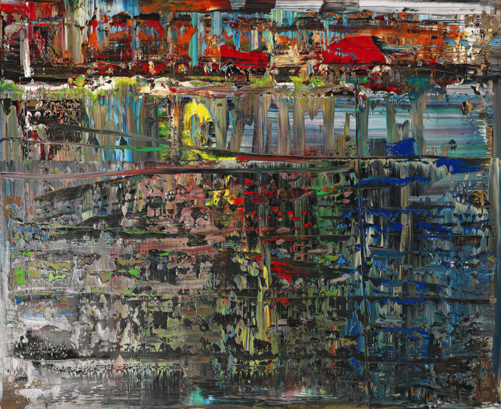 While all of these excitable pieces sold well over their estimated prices, Gerhard Richter’s Abstraktes Bild sold at 529,250 GBP only a slight margin over its estimate. Executed in 1990, Abstraktes Bild is a wonderfully complex interplay of ambiguity and colour. With its lyrical and reflective qualities resonating both on the surface and deep within the layers of paint, Gerhard Richter here epitomizes his explorations into Abstraction, which he began in 1976, and seems to both reveal and conceal. This entry was posted on Friday, October 16th, 2009 at 7:24 pm	and is filed under Art News, Auction Results. You can follow any responses to this entry through the RSS 2.0 feed. You can leave a response, or trackback from your own site.